Get ready for a whole lotta pics (and me in a bra, sorry). 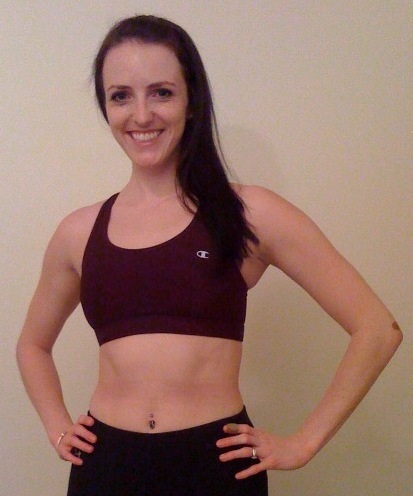 Product Description: "At last...a compression sports bra that plays up your prettiest curves. Its secret? Contoured front seaming, designed to flatter your figure." Super-sleek stretch knit helps stabilize bust to minimize painful bounce. Double Dry fabric technology wicks moisture to keep you dry. Breathable mesh lining allows cooling ventilation. Mesh-covered keyhole back adds extra cool where it counts. Covered elastic bottom band gives added support and comfort. Tag free for non-chafe softness, with stay-put racer-back straps. Description found HERE. Normally retails for $30, on sale for $19.99! When I first tugged/shimmied/wiggled into this bra I was worried I might suffocate. I think I might have worked up a sweat just putting the thing on! It was beyond tight, and my girls were smooshed into submission...but hey, it's about how the bra "works" right? The straps are very sturdy, and despite being tight, it was not chafing me anywhere. My only gripe was that my shoulder blades felt a little constricted by the openings in the back and the material was tight. I've actually worn this sports bra a few times and noticed right from the beginning that there was limited "bounce" (an excellent thing for sure!). When they say High Impact, they mean it. This bra has quickly become one of my favorites and over some time has stretched out and fits much better than at first. And, I'll be the first to admit that when I see something is "Moisture-Wicking" I kind of think it's gimmicky, but now I'm convinced it isn't. Let's just say that after I took this off, my skin was completely dry, but the bra was wet from my workout. Holy cow! It does wick sweat! Not really a con, but it's pretty hilarious to try to get in/out of! Product Description: "Warmth without weight. 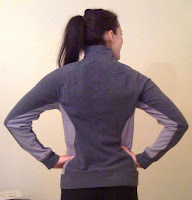 This sleek women's jacket keeps you warm and dry yet never looks heavy or bulky." Built-in Double Dry system wicks moisture for quick-dry comfort. Shapely (non-chafe) seams flatter your feminine curves. Non-binding mock-neck collar protects you from wind and chill. Bar-tacked kangaroo pockets warm hands, hold small essentials. Stretch binding accents hood...reinforces cuffs and hem. NOTE: Fashion colors have contrast insets and contrast trim. Description found HERE. Normally retails for $38, on sale for $18.99. This jacket is now my go-to cover up on any day, and looks great with my jeans and sneakers. I love it for lounging, just not for running. For more information check out http://www.championusa.com/ or become a fan of Champion on Facebook. I have a high impact Champion bra, too, and it's my favorite bra right now. Yes, super squishy and hard to get into but absolutely no movement and super dry. Just the thought of running in fleece makes me want to take a shower. Ick! Oh that fleece looks super super comfortable and cute! I wouldn't want to run in it, but it sure would be perfect for warming up after running in this cold weather! Champion bras are my FAAAVORITE! And I love that I can find them everywhere...especially the C9 line at Target! The top looks awesome. Gonna get me one of those right now. I really like the Champion bras and buy the basic one from Target. Great reviews, and great pictures! Thanks for the review! Have you ever tried Moving Comfort bras? I'm curious the difference between the two? i love champion sports bras! Zoe thanks for stopping by my blog for the Lift your sole giveaway! I loved your review. I am not a fan of fleece either! GREAT reviews!! I have never tried their sports bras, but I am curious. 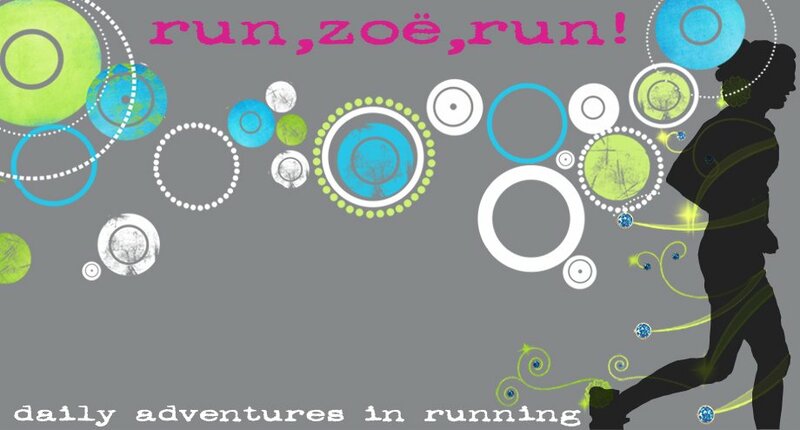 I dont think Fleece ismade for running period, especially in rain..
Great reviews, Zoe! These sound like some excellent products. 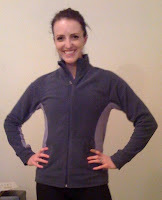 The fleece looks so cozy but like you, I would overheat in that running for sure! the fleece looks perfect for apre run! You might want to take a look at Breeze Comfort padded bras and sports bras. The bras are made with patented bra pad technology. The bra pads have perforations throughout to facilitate air circulation to the breast area. This helps release heat and helps prevent sponge effect (sweat collecting in the traditional bra pads). I am a big 40DD, and i work as a dog walker, so i do a lot of running about all day. I read all the reviews on several different bras and have had champion bras before, but nothing compares to the comfort of this bra, i can wear all day and it doesn't "bite" anywhere, no wire to break or poke you and it holds my large 'stuff' still so i can run and play without any pain or discomfort. I brought 2 and will buy barely there bras more. We are going on vacation and i know that i will be well covered in this very comfortable and fast drying bra. I have told all my friends that are big busted but active like me. will be available in May. Big selling point, these new UK Replica watches to you, the use some advanced features, be found in modern smart Replica Rolex Watches , is to obtain the shape of a traditional Watches Replica.Mars Designer handbags internationally renowned award nominated Global Mobile Award is celebrating 20 years of innovation and achievement of the entire mobile phone industry, was appointed in 2015. Pay Mars handbagreplica was chosen the best of aa only five finalists.